ideas for a two year old??? Do any of you have ideas on what I can do for 12 days of Christmas for a two year old? I have day one a stuffed puppy dog. I was thinking about making a fabric picture book for like day 12 with 12 pages of things he can recognize. I will ask his mom what his favorite treat is. If something like goldfishes, I will get like say 5 packages of them for day 5 or something. two year olds are a little harder than the older kids. so much to consider.............it will go in the mouth. will parts come off? etc. to all my blogging friends, I will not be able to post for a while as hurricane Sandy is coming our way . We will be preparing for it and then may be without power so I will return as soon as things are back to normal. Anyone else in Sandy's path, be safe! My granddaughter loves the cats. She thinks Phoebe is so soft and wonderful. We do too! Have only a couple more things to finish off her 12 days and then it is on to the boys! They will be a little tougher. having fun and unfortunately won't be coming up for air often. I will try and post as much as I can when I can. It is fun to try and think of things to make or do to make a holiday special. Ordered this little one an Alphie robot to learn her numbers and ABCs. I love playing with it so hopefully she does too! What was your favorite Christmas toy when you were a youngster? Mine was a typewriter and for my brother it was a 10 speed bike. It is fun to go back in time and remember finding that special something on Christmas morning under the tree. Another adorable cat picture taken from the internet. 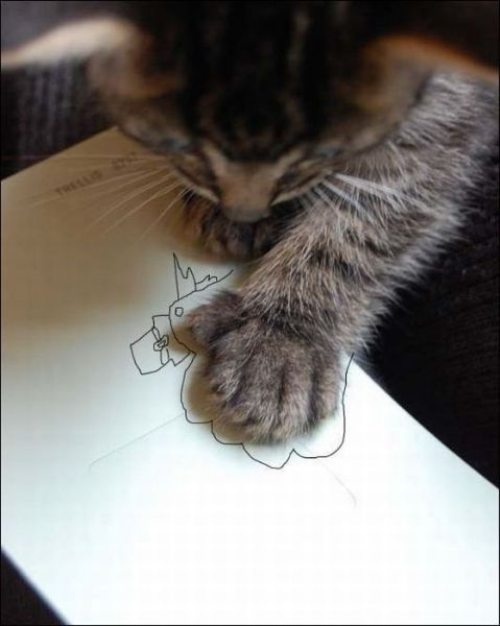 Looks like my Phoebe this time drawing around her paw to make a Thanksgiving turkey. too too fun! Now you know why I have UFOs. LOL too much time on the computer! trying to get ready for the Fall and Winter months around here. As you can see I have a lot of "help". This is Phoebe sleeping and enjoying her "retirement" as an elderly cat. not much fun stuff going on. Just getting summer clothes put away, warmer clothes washed and put into closet and ordered some butter dishes for the upcoming holidays as mine broke. We love our butter dish that keeps the butter soft enough to spread and we had TWO. both have been broken so we are using parts. I ordered two new ones from Pfaltzgraff today. Hopefully they will ship before the holidays. What kinds of things are you doing to get ready for the upcoming busy months? This is the Easter version of the bib. too flowery for a boy so will keep for the next girl that is born. these are so much fun. they are easy to sew and fun to find the fabric combo you want to use. this is the Valentine bib. using scrap of heart fabric and red piece with red back. this is the pattern I use for baby bibs. excuse my messy ironing area- not the greatest for photo shoot. LOL but at 4am you take what you can get. anywho, this is a bib I made for the gal due in Feb. I will put in with the quilt and make some others. when we did the bib of the month, we used this print for Jan for a wintery kind of print. it is reversible and you can see the back below. fun pattern with easy velcro closure and nice and big to catch those messes. I have also done them using up bits of fabrics and making them patchwork. they look good no matter what. denim is always good too! this isnt right. Our eldest cat Phoebe was found the other day napping on the grocery totes trying to make them comfy. While Mr. "King" Dunkin was snuggled in on my side of the bed. He went there as I was stripping the bed and remaking and when I went to fix this corner, here he was all cozy. Fall is the time of year for some fleece ponchos. this one is for a young girl. I am hoping it will fit my granddaughter who is 4.
it is a simple design for no sew..........just a square with a center hole cut for the neck. and then cut even lengths of fringe on edges. easy peasy and so warm for those days you want to jump in a pile of leaves! what Fall things are you making? found a great deal on these plain glass ornaments at our local Job Lot.we always let the kids put different colored paint in them and swirl then let the paint drip out before closing up. they look all marble like and pretty. Does anyone have any other ideas for this type or ornament? Anyone ever make these? If you look close you can see the year 1988. yes that is how old it is. when I was first married we had very little and both hubby and I were starting new jobs. He had two young children from a previous marriage that we had custody of so times were lean. Our first Christmas tree was filled with homemade pac man Christmas ornaments in bright yellow! It was beautiful! The kids painted them and I had made them out of the salt dough recipe. It is a simple recipe of 2 cups flour, 1 cup salt, 1 cup water. If you wanted to color the dough you could add food color or coffee or tea but we prefer to paint them and then spray shellac seal them. I have also sealed them by dipping in melted wax for a different non shiny look. Anyway, if they are stored where no moisture can get at them, they will last a long time as you can see. I kept him even without his hat pompom as I want to make more of these this year. he was free formed with my hands. easy peasy if you look at the dough as different size balls rolled into the shape you need. anyone else do homemade ornaments with the kiddos?????? maybe I should finish this up for her? I found some baby pacifiers and toothbrush. I must have bought for diaper cake and misplaced. will come in handy anyway. I am still sewing and cutting out fabric. I have been working a lot of hours (month end) so my sewing time is limited. I get it ready in "kits" so that when I have precious time the stuff is ready to go. and if I have more than one I can sew production style making it go quicker. Do any of you have hints and tips to "make more time to sew"? I need to get my sewing station set up in one place. that would surely help! One of my nieces friends is having a baby in Feb and just found out it is a BOY! Any quick and easy ideas for some nice gifts I could make? I was thinking a small quilt, bibs and burp pads? He mom died when she was 12 so wanted to make her something to say we care. I am not sure who is her "surrogate mom" to help her in this new phase of her life. she is 20 now and a great "kid"! I may also be helping niece make a diaper cake. we will see as she is also looking to make maybe a diaper bag, carriage cover and other things. I saw those "pee pee tee pees" for boys and laughed. they look easy too! they are sometimes called "wee wee wigwams" too. to put over the boy when changing his diaper so you won't be showered! sounds like a good idea to me! Any links or ideas you have would be welcome. thanks in advance! I want to get started now because not sure when a shower will be done for her. I really need to work on my photography skills and get a new ironing board cover but you get the picture.......more mug rug sets........can you tell I like blue???? tons of blue scraps in the bin. the bottom wave fabric will be the back and the blue on the left is the cup sleeve. and I like green too. Check out the cute yellow doggie fabric. that originally was a fat quarter that was used to make a wallet and this is a scrap that was left. this will make a cute set for a dog lover. problem is I dont need ANOTHER hobby right now so I will try and at least be mediocre in my picture taking.